Jessica Vaughan is the director of policy studies and Preston Huennekens is a research assistant at the Center for Immigration Studies. On December 11, 2017, Akayed Ullah strapped a homemade pipe bomb to his chest and entered the New York subway system. According to news outlets, Ullah is a 27-year-old immigrant from Bangladesh who came to the United States legally through chain migration. Specifically, he arrived after his aunt or uncle won the visa lottery and then, in turn, sponsored his mother for an immigrant visa. She was able to bring him along as her "child", even though he was 20 years old at the time.1 The family, numbering five or six people, arrived in 2011. The recent history of immigration from Bangladesh is a good case study for how the visa lottery program, in combination with chain migration, has created a large new pipeline of immigration from certain countries whose citizens are heavy users of the visa lottery. The visa lottery has consistently resulted in thousands of new immigrant visa issuances in Bangladesh in most years since 1995.2 For a seven-year period (2005-2011), citizens of Bangladesh made up between 5 percent and 9 percent of all lottery visas issued, making Bangladesh one of the largest visa lottery sending countries. 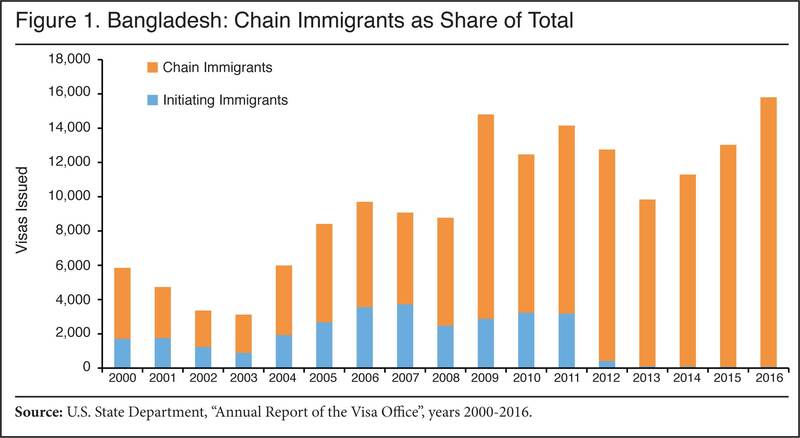 Prior to 2009, a significant share of immigrant visas to citizens of Bangladesh were issued to initiating immigrants (non-chain migrants, or first-in-the-family immigrants), who were mainly lottery winners.3 Since then, the proportions have shifted, and the great majority of all of the immigrant visas issued to Bangladeshis have been chain migration cases, with a large share appearing to stem from visa lottery winners. Bangladesh was removed from the visa lottery after 2012 due to large numbers of new immigrants qualifying in family-based categories, but chain migration has resulted in still higher numbers of immigrant visa issuances. Chain migration has caused annual immigrant visas from Bangladesh to grow from 5,845 in 2000 to 15,801 in 2016, an increase of 170 percent. The "Parents" category is the largest single category of immigrant visas issued in Bangladesh, representing 26 percent of total chain migration from Bangladesh. 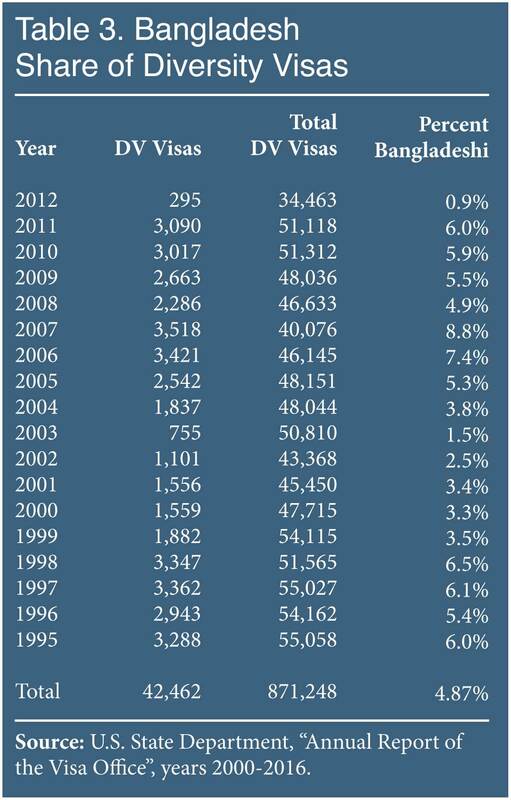 Table 1 breaks down annual immigrant visa issuance data from the State Department between 2000 and 2016, and Figure 1 shows chain immigrants as a share of the total population of immigrants from Bangladesh from 2000 to 2016. In the last decade, the number of initiating immigrants (that is, immigrants who are the first in their family to immigrate to the United States) from Bangladesh was steady until 2012, after which Bangladesh was disqualified from the visa lottery program. Meanwhile, the number of chain migrants generally rose over the same time period, as prior arrivals in all categories sponsored additional relatives. Very few Bangladeshis immigrate to the United States as self-sponsoring skilled immigrants or employer-sponsored immigrants. The State Department has issued only 2,633 employment-preference immigration visas to citizens of Bangladesh since 2000, accounting for 1.61 percent of all Bangladeshi immigrant visas in that time. Most arrive because of chain migration. Reports indicate that Ullah's initial immigrating family member arrived in the United States because of the visa lottery. Citizens of Bangladesh were able to take part in the visa lottery between 1995 and 2012. In that period, a total of 42,462 individuals came to the United States through the program. (See Table 2.) This represents 4.87 percent of all lottery visas to the United States during that time period. The combination of the visa lottery and family-based (primarily chain) migration caused total immigration from Bangladesh to swell, to the point that the State Department finally removed the country from list of foreign states eligible to enter the lottery, effective beginning with the 2013 lottery. 1 For more on the visa lottery, see the Center for Immigration Studies website. 2 1995 is the earliest year for statistics published on the State Department website. See "Table VII: Immigrant Number Use for Visa Issuances and Adjustments of Status in the Diversity Immigrant Category" in "Report of the Visa Office 2000" and "Report of the Visa Office 2002", U.S. State Department. 3 For this report we use annual immigrant visa statistics published by the State Department, rather than total annual green card issuances published by DHS. 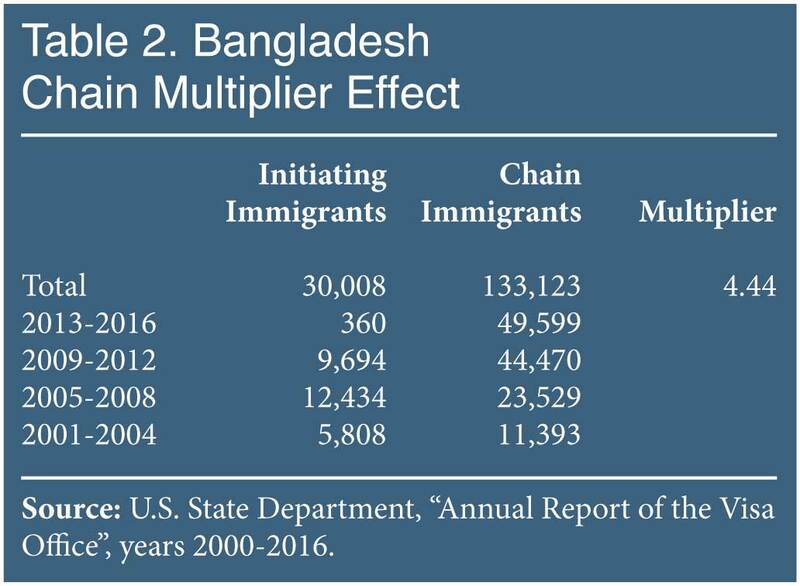 Although the State Department statistics count only immigrant visa issuances and thus do not capture all new immigrants from Bangladesh each year, they are presented in sufficient detail to identify chain migration categories. Since the vast majority of new immigrants from Bangladesh arrive with an immigrant visa issued abroad by the State Department, rather than adjusting to permanent legal status through USCIS processing, the State Department statistics are sufficiently representative of total immigration in this case. 4 See Jessica Vaughan, "Immigration Multipliers: Trends in Chain Migration", Center for Immigration Studies, September 2017. 5 Marta Tienda and Stacie Carr, "Family Sponsorship and Late-Age Immigration in Aging America: Revised and Expanded Estimates of Chained Migration", Princeton University, August 2013. 6 Andrew R. Arthur, "Niece-Visa Terrorist? : Another F43 in the news", Center for Immigration Studies, December 27, 2017. 7 For more on the RAISE Act (S.354), see the Center for Immigration Studies website.